In celebration of the Heritage Month this May, the NCCA Gallery holds a print retrospective of BenCab, which includes the most essential outputs in the printmaking medium done by our National Artist Benedicto Cabrera. BENCAB Graphics: A Print Retrospective includes the most essential outputs in the printmaking medium by our National Artist Benedicto Cabrera or popularly known as BENCAB. From the artist’s collection of etching prints delivering the most iconic images in printmaking in the Philippines; to the very recent prints that involve the exhilarating combinations of processes which challenge the definitions of the medium and are, most likely, the most ambitious undertaking ever done by a Filipino artist; this body of work, to date, has found the artist profoundly fulfilled. Jonathan Olazo, a noted contemporary visual artist and art educator, is the curator of the exhibit. 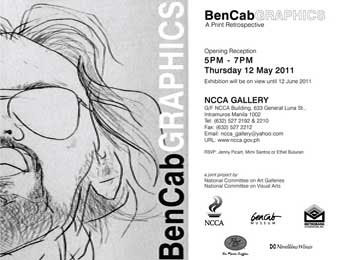 A joint project of the National Committee on Art Galleries (NCAG) and National Committee on Visual Arts (NCVA), BenCab Graphics: A Print Retrospective will open at the NCCA Gallery, 633 Gen Luna St. Intramuros, Manila on 12 May 2011 at 5:00PM. Exhibit is on view until 12 June 2011. The exhibition is also made possible with the support of Metrobank, Figaro Coffee Inc., Bencab Museum, and Novellino Wines.